On May 4, the ribbon was officially cut on the Roger and Francine Jean Student Center Complex, gaining the entire college community a dynamic new gathering, working, and learning place in the very center of campus. College trustee Roger L. Jean '70, HD ’06 and his wife, Francine, made a $6 million commitment (the largest individual gift in the college’s history), which enabled the college to create the building which now bears their name. The Jeans attended the historic ribbon cutting event, at which they were lauded for their extraordinary generosity and dedication to Saint Anselm College. Read more about the Jeans. Roger also offered words of wisdom to students, encouraging them to allow themselves to be transformed by their education, to achieve their own definitions of success, and to continue their relationship with the college community. Read Roger Jean’s full remarks to students. After years of planning and breaking ground in October 2016, the new complex rose from the site of the Cushing Student Center, which was built in 1960. It is already a hub of campus, connecting to Stoutenburgh Gymnasium and with the multiple student services now based there, including the Center for Intercultural Learning and Inclusion, Meelia Center for Community Engagement, Campus Ministry, Career Development Center, International Programs, Class Deans’ Offices, Health Services, College Bookstore, and Mail Center. Spacious lounge areas, wide hallways, a 248-seat auditorium, a Starbucks café, a glass-walled second floor flexible function room, and abundant natural light provide an open and comfortable environment. Read more about the Student Center building. Now installed in a beautiful new space, The Meelia Center for Community Engagement recognizes Richard J. Meelia ’71, HD ’14 for his generosity and dedication to his alma mater, the students, and the greater community. The Walter J. Gallo ’58, HD ’08 & Julie Gallo Café honors benefactors William “Bill” T. and Cynthia O’Connell’s lifelong friendship with Walter, as well as Walter’s exemplary service to the college through decades as its chief fundraiser and ambassador. The Father Jonathan, O.S.B., Center for Intercultural Learning and Inclusion (formerly The Fr. Jonathan DeFelice O.S.B., ’69, HD ’15 Multicultural Center) was made possible by gifts from alumni, faculty, friends, and staff. In 2013, the Center was named for Father Jonathan, whose groundbreaking work for diversity and inclusion as president led to the cultural center’s founding; the updated name is reflective of the growing student body and the intercultural learning that takes place there, for all students encountering many different views and experiences. The CGI Game Room is courtesy of a generous gift from Daniel F. Cronin, President, CGI Business Solutions. 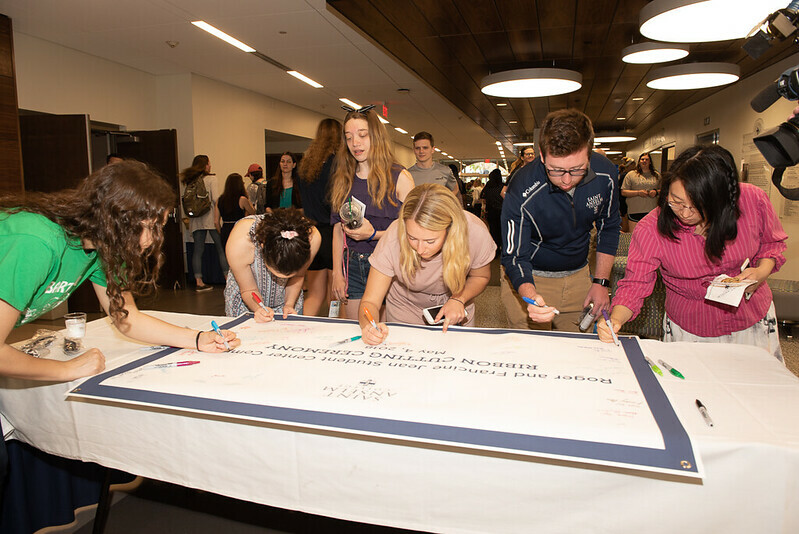 An additional 30 spaces in the center have been named by alumni, friends, and trustees, who have elected to name an office, study area, or suite in recognition of their affection and admiration for Saint Anselm and their experiences with the college. “It’s just a great place for the entire student body to come and hang out …This is such a modern building now. The amount of work that everyone has really put into making this such a dynamic and fulfilling environment for everybody on campus, I think it’s amazing."